Here's a May, 2013 notice from the Ontario provincial parks blog. The present Liberal government has, in a shameful move, eliminated or severely reduced some parks as well as park services that have been operating for decades. In addition, the Ontario parks page (see the link below), which has been generally pretty good, has changed. It has updated its pages and their addresses, but in their search tool they have left many outdated links. It's difficult to get to links to some non-operating parks. Go figure. Operating parks have full services for campers and day hikers. Non-operating parks have no facilities. Aaron (Ontario Parks page) A small operating park near Dryden, on Thunder Lake, north of Quietico.117 ha (289 acres). Has 3.1 km of hiking trails and 98 campsites. The city of Dryden has a site for the park and a page about the two trails in the park. Abitibi-de-Troyes (Ontario Parks page) A "non-operating" park (no facilities for visitors). 11,068 ha (27,350 acres). Access is by air or water only. You can camp and canoe and there's a 12-km peninsula that juts into Abitibi Lake, which the parks site describes as shallow, muddy and prone to extreme wave action; Abitibi is a big lake. The park runs in a narrow strip along Abitibi River from (very roughly) Iroquois Falls to the Lake. Useless information: south of Abitibi River and south west of the lake is a lake called Painkiller Lake. Interesting to speculate on how that lake got its name. The area has connections to the Quebec Abitibi area to the east., which is rich in history. There's a Quebec national park, the Parc national d'Aiguebelle, east of Lake Abitibi, that features a 64-metre-long suspension bridge 22 metres above Lac La Haie. It's an area that definitely needs lots of time to explore. Check out the Quebec Heritage Web for more on this area. Adam Creek: A tiny "non-operating" park (no facilities for visitors). 50 ha (124 acres). About 90 km north of Kapuskasing (on Highway #11), the creek flows into the Matagami River, which flows to the Missinaibi, which flows to Moose river, which flows to James Bay. A little creek with major connections. Ontario Hydro uses the creek as a "flood channel;" I presume that means it could be unnaturally full of water during high water periods. Agassiz Peatlands (Ontario Parks page) A "non-operating" park (no visitor facilities).The parks site says it's a good place for "nature walks." 2,315 ha (5,720 acres). About 110 kilometres northwest of Fort Frances, near the Manitoba border. (Fort Frances is on Highway #11, about 350 kilometres west of Thunder Bay.) The area "closely resembles a prairie" says the park site, with muskeg, forested swamps and more. There is a Lake Agassiz Peatlands Natural Area to the south of International Falls, Minnesota. Agassiz Lake was a massive body of water larger than all the Great Lakes combined. it was fed by glacial runoff. The Agassiz Peatlands are what is left of this lake. Albany River (Ontario Parks page) A "non-operating" park (no visitor facilities). 95,100 ha (234,996 acres). It's 320 kilometres north of Thunder Bay,165 km northeast of Sioux Lookout, and 170 km northwest of Geraldton. it runs along the Albany River, north of the much larger Wabakimi Provincial Park. Back country canoeing is a recommended activity here. About the only way to get there by car is via Highway #599. Albert Lake Mesa (Ontario parks page) A "non-operating" park (no facilities). 130 ha (321 acres). Forty-eight kilometres northwest of Nipigon,between lakes Nipigon and Superior. It's hellish hard to find on a topo, but it looks like Highway #527 runs just to the east, and I swear that slightly to the south there's a Twerp Lake with a Twit Creek running into it. What are they doing up there? Anyway, if you're on your way to Quietico, maybe it's worth a stop with a moraine, mesa and questa all in one region. A mesa is an isolated flat-topped hill, a questa is a hill with one side sloping gently and another with a steep face. A moraine is a ridge of rocks created by a glacier. Alexander Stewart (Ontario Parks page) A tiny "non-operating" park (no facilities and no camping). 31 ha (77 acres). In the County of Renfrew, township of McNab Braeside (east of the town of Renfrew), west of Ottawa. Ontario Parks identifies it only as "central" so they really don't want you to know where it is. Algonquin (my page) Ontario's most famous park (Ontario Parks Page). About 265 km north east of Toronto in central Ontario. 765,345 ha (1,891,201 acres). The park has 17 trails adding up to over 500 km, from 1.5 to 11 km long, plus over 140 km of backpacking trails to remote campsites. The Friends of Algonquin Park have lots of information on the park's trails, including brochures with all the trails laid out. You can order brochures from the Friends' site at reasonable prices. 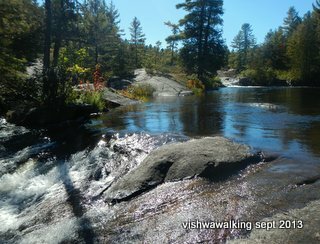 Left: the perfect place for lunch: the top of High Falls on the Eastern Pines Backpacking Trail in Algonquin. The "jacuzzi." is at the head of the pond in the distance. Arrow Lake 430 ha (1063 acres). A non-operating park 70 kilometres southwest of Thunder Bay, near the Ontario-Minnesota border. It has a boat launch and toilets. Good for swimming, boating and fishing. This is solely an armchair observation concerning my readings of the area, but canoeists might want to research this park as a point to set off (generally east) into other routes. Arrowhead Peninsula (Ontario Parks page) A non-operating park south west of Thunder Bay on the Ontario-Minnesota border and just east of Quietico Provincial Park. 815 ha (2014 acres). Situated on a peninsula and some islands, on Northern Light Lake. No facilities. Aubrey Falls (Ontario parks page) A non-operating park 85 kilometres north of Thessalon, near the top end of Lake Huron. 4,860 ha (12009 acres). It has toilets and a "scenic outlook," (the park website's term), probably referring to the high waterfall that gives the park its name. It could be as high as 150 feet (an estimate I could not confirm). There is a hiking trail. You can see some pictures of the falls here, along with a reference to a trail to the smaller Grindstone Falls to the south. Awenda (Ontario Parks page) A full-service operating park with year-round activities, north of Penetanguishene on the shores of Georgian Bay. 2,915 ha (7203 acres). You can ski and snowshoe in the winter, but there is no winter camping. Giant's Tomb, a five-kilometre long and two-kilometre wide island just off the coast, is a good day trip if you have a boat, as it has excellent beaches. There are other islands nearby, part of the nearby Georgian Bay National Islands Park (Wikipedia link). Campsites are spread farther apart than most provincial parks. There is a group campsite area (tents only) and a "no radios" area. The park has a Friends of Awenda group. Balsam Lake (Ontario Parks Page) Located on the Trent-Severn waterway on Balsam Lake, about 45 km by road west of Bobcaygeon or 35 kilometres north of Lindsay (Kawartha Lakes) on Highway #35, which runs up to the east of the lake. On the opposite shore from the park is Indian Point Provincial Park (see below), which is an alvar, so it might be worth exploring if you had a canoe. 506 campsites. There are two trails. Lookout is 2.6 km. The park's description: "walk through eskers and kames formed over 10,000 years ago from the Wisconsin Glacier. Enjoy a panoramic view of the surrounding are Plantation trail is 4.2 km and is "a moderate forest trek with both natural and pioneer highlights." Bass Lake (Ontario Parks Page). About 10 miles west of Orillia, just south of Highway #12 and just east of where #12 branches from #11in Orillia. 182 campsites. Only one 2.8 km trail, the Waterfront Trail. From photos, it looks like there's a good deal of boardwalk and the first half kilometre of the trail is paved. There's an interpretive guide you can pick up when you're there. Apparently the Rowe Homestead, which is part of the trail, is a working farm and has been for over 100 years. Batchawana Bay (Ontario Parks page) Just north of Sault St. Marie at the eastern end of Lake Superior. it's a strip of land on either side of Highway #17. it's open for day use only for swimming, boating and fishing. From photos, it has a fine sandy beach. A very short jaunt to the north is Pancake Bay Provincial Park (see below) that has camping and other facilities. Indian Lake Provincial Park (Ontario Parks Page) Located on the Trent-Severn waterway on Balsam Lake, about 45 km by road west of Bobcaygeon or 35 kilometres north of Lindsay (Kawartha Lakes) on Highway #35, which runs up to the east of the lake. There is a road along the west shore, but I have no idea if it is accessible. The park touches on a couple of roads at its northern end. It's on the eastern shore of Balsam Lake, just across from Balsam Lake park (see above), so it could well be explored by boat from there. It's an alvar (a plain-like geography with a lime base and thin soil, which makes it home to some distinctive plants). Menzel Centennial (my page) or Menzel (Ontario Parks page) A "non-operating" park (no facilities).. 627 ha (1,550 acres), according to Ontario Parks, which may be outdated. Other sources say 850 ha (2,100 acres). A trail, opened in 2006 with new boardwalks and signs is 1.8 km long and leads to Mud Lake. Topo map 31C/6. The park has one of the most significant "fens" in southern Ontario. The definition of a fen varies from a generic "another name for a bog" to "a wetland that exists on organic or rich muck soil" (the Menzel Park brochure definition) to a peatland covered by water, which can only be drained artificially. click the link above to this site's Menzel Park page for a more detailed definition of fens and of the trail. Pancake Bay Provincial Park (Ontario Parks page). Just north of Sault St. Marie at the eastern end of Lake Superior. Highway #17 runs through it. It features three kilomeres of sandy beach, which from the photos look spectacular. 325 campsites, including five yurts. it has two trails. Pancake bay Nature Trail is 3.5 km and listed as easy. Lookout trail is 14 kilometres and the lookout gives a good view of Pancake Bay. It's seven kilometres out and back if you just go to the lookout. The park site says there is a chance of seeing moose on this trail. Stoco Fen Provincial Park (Ontario parks page, but it contains no content). In 2009, Ontario Parks had a page on this park that was "under construction" and had been since 2002. In 2013, you can still link to that site if you know the complete address (the main site does not offer a link) — but it's still "under construction"! This link indicates that the superintendent of Bon Echo park may be responsible for it. It is a piece of land near Tweed, Ontario and is described as "a 101 hectare (ha) nature reserve class park established in 1985 through regulation of public and private lands. The park protects most of the open fen component of the provincially significant Stoco Fen wetland and Area of Natural and Scientific Interest." This is a "non-operating" park (no facilities) that features some fragile plants. (See my Menzel Park page for a definition of a fen.) Just south of Tweed on Highway #37, cut off to Stoco on the Marlbank Road. In Stoco, just past the baseball field, turn left and head east on East Hungerford Road. You'll see the fen on the right (south) side. Here's a really good and informed blog by Pamela Martin with information of what you can find in Stoco Fen. Wabakimi (Ontario Parks page) North of Thunder Bay. It's classed as a wilderness park. You'll need a canoe or an airplane to get to its wilderness lodges. 892,061 ha (2,204,321 acres). Surprisingly, as with other parks, hunting is allowed under some circumstances, so be prepared. The park was relatively small until 1997, when it was expanded "to almost six times its original size, creating one of the largest protected boreal forest reserves in the world. The new park is the second largest in the province and adjoins three provincial waterway parks: the Brightsand River to the Southwest, Kopka River on the south east and the Albany River to the north" (from wilderness trips). The parks site does not specifically mention hiking, but does note fishing and canoeing. It's wild country up there, so this is definitely back country stuff.